Having determined a date (or rather, two dates), the media now seems content to move on without conducting even the most perfunctory investigation into these medieval precedents or any consideration of how they might relate to the latest instance of what is an exceedingly rare event in Christian history. Were the resignations of Celestine V and Gregory XII in any way comparable to that of Benedict XVI? Were the “resignations” of these two medieval popes actually resignations? And which resignation serves as a better precedent for the current pope’s decision? Let’s start with Celestine V. Born in Sicily of humble origins, Pietro da Marrone, Pope Celestine V, was a hermit and member of the Benedictine Order whose life spanned most of the thirteenth century. He is known primarily for having founded the Celestine Order, a highly ascetic branch of the Benedictines, and for having allowed himself to be elected to the papacy at age 79, against his better judgment and despite being temperamentally unfit for the job. He only surrendered to the entreaties of others, including two contemporary kings, after the papacy had been vacant for two years! After serving only five months, however, he clearly had had enough. He resigned, having first issued a papal decree justifying such a course of action for a pope. Among other reasons, he cited both his health and a desire to lead a purer and more tranquil life. Just after this period, in the fourteenth and early fifteenth centuries, the western church was rocked by two related events known as the Avignon Papacy (1305-1378) and the Great Schism (1378-1417). During the first of these, a series of French popes left Rome and took up residency in the southern French town of Avignon on the Rhone River. In 1377, the last of these French popes, Gregory XI, returned to the Holy See, but died within a year, setting the stage for the first papal conclave to be held in Rome in seven decades. In April, 1378, the cardinals who had accompanied Gregory back to Rome elected an abrasive Italian churchman who took the title Urban VI. Five months later, those same cardinals, highly disillusioned with their original choice, declared the first election invalid due to its having been conducted under threat from the Roman crowd, which was demanding the election of an Italian pope. They then selected another pope, a relative of the French king, who took the papal name Clement VII and reestablished himself in Avignon. For nearly forty years, this division endured as the west was treated to a vision of two and eventually three squabbling popes, hurling anathemas and even preaching crusades against one another. Meanwhile, European nations chose up sides with about half supporting Rome and half supporting Avignon. The original division became self-perpetuating when, upon the death of each rival pope, his supporters elected a successor. Gregory XII was the last of the Roman popes to reign during the Great Schism. Although his career is nowhere near as interesting as Celestine’s, it does shed useful light on the whole issue of resignation. 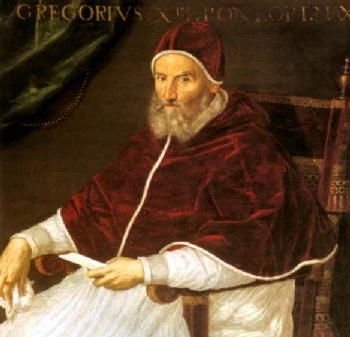 Gregory was chosen pope in 1406 on the condition that if his rival at Avignon, Benedict XIII, were willing to resign he would do the same, thus clearing the way for an end to the schism. Ultimately, neither man proved willing to take this step. As a result, disgusted cardinals from both camps met and called for a council of the church at which they planned to depose both popes and elect a single successor. The council met in 1409 in the Italian city of Pisa. Both popes were invited and when both failed to show up, the cardinals deposed them in absentia as heretical schismatics who were scandalizing the church. Afterwards, the council selected a new pope, Alexander V, who soon died and was replaced by a worldly soldier-turned-churchman, Baldesare Cossa, Pope John XXIII, whose only real virtue seems to have been that he could defend the council. Since neither of the other two popes accepted dismissal, for the next six years, the western church had three popes. 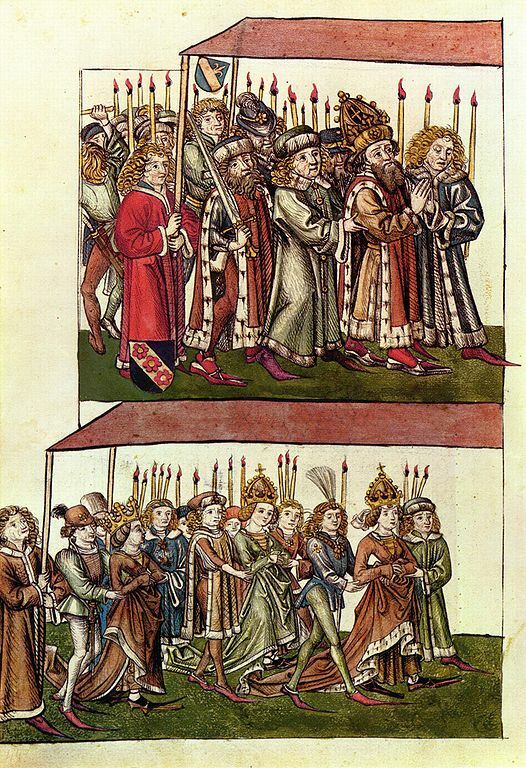 In October 1413, another church council was called at the instance of King Sigismund of Germany and Hungary (later the Holy Roman Emperor); it began to meet north of the Alps, in the city of Constance. By 1417, the Council of Constance had reunited the Church under a single pope, Martin V, thus putting an end to the Great Schism. As part of the process, on July 4, 1415, Gregory XII’s representative at the council tendered his resignation in absentia. Technically, Gregory resigned, but not with any great willingness. The resignation itself was of questionable status given that six years earlier the Council of Pisa had already deposed Gregory and declared him both a heretic and a schismatic. For such a figure to now be allowed to resign is, to say the least, highly ironic. In effect, the Council of Constance was sweetening the deal in order to get Gregory’s blessing on any election that would follow. It did so by cancelling the earlier deposition, expunging his conviction as a heretic and schismatic, recognizing him as the Dean of the College of Cardinals, and allowing the family members he had appointed as cardinals (despite his earlier commitment not to undertake any such appointments) to retain their positions. While the council would undoubtedly have made similar concessions to Gregory’s rivals, neither man proved willing to renounce his position. As a result, John XXIII was deposed, tried, and found guilty of heresy, schism, and a whole range of more mundane crimes, and imprisoned. Even he, however, was eventually forgiven and made Cardinal bishop of Tuscany. The third pope, Benedict XIII, living safely outside the reach of the council in his native Aragon, continued to claim that he was the only legitimate pontiff. As his last act on earth, he appointed four new cardinals and charged them with electing his successor. In a complex election, they produced two more popes, Clement VIII and Benedict XIV, both of whom later abdicated. Although the resignation of both of these men postdated by a decade that of Gregory XII, neither is recognized as the most recent to resign since neither is recognized by the church as a true pope. Despite the international media consensus, there is no comparison between the resignation of Gregory XII and that of the current pope. At the time of his departure, Gregory’s legitimacy was already very much in question. He was under great pressure to resign and would have faced removal and possible imprisonment had he refused. Instead, for his willingness to go along, he became dean of the College of Cardinals. By contrast, no one would question the legitimacy of Benedict XVI. No pressure to resign has accounted for his decision; instead, that decision was completely voluntary. In short, anyone who looks to Gregory XII as a precedent for the present situation is ignoring the very different historical context that surrounds the two resignations. On the other hand, the resignation of Celestine V is much more in line with Benedict’s. Both men willingly (in Celestine’s case, eagerly) chose to leave the papacy and its strenuous demands. Both cited their health as one reason for quitting a job they were no longer physically able to perform. If there is a major difference, it might lie in Celestine’s wish to lead a more pure life by escaping the corrupting influences of church government; given Benedict’s history as an “organization man,” it seems unlikely that he would concur in these sentiments. Even with that difference, it is fairly certain that Benedict would point to Celestine rather than Gregory as an inspiration for his decision to retire. Perhaps he was already thinking along those lines when he proclaimed the year from August 2009 to August 2010 as the Year of Saint Celestine.